Thanks to Scooter Chronicles AndrÃ© for spotting this one around W Burnside & 21st in Portland. It’s one of Starbucks’ cute, winter-themed billboards. 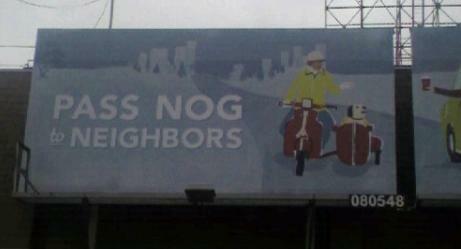 If I remember the other half correctly, the scooter guy is receiving a gift of nog from folks in a yellow minicar. I checked the Starbucks website but didn’t find anything else with this graphic – they should do a series of postcards or something. This entry was posted in Food, Wine, Miscellaneous by Cassie. Bookmark the permalink. Cool – about the new Gap catalog – please send us photos! About the Starbucks billboard – I think it’s particularly sneaky how the vehicle looks a bit like a motorcycle and a scooter. When I first saw it I thought it was a motorcycle.